Egypt – Can You Relate? On February 11, Hosni Mubarak resigns and headlines blare –“This is what freedom sounds like,” “People win” and “Egypt will never be the same.” Together, courageous women and men forced radical change. Yet, incredibly, some things remain the same. 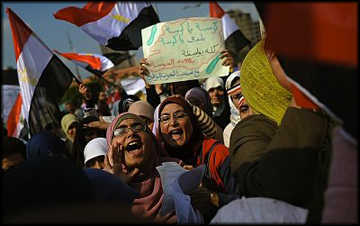 As the Egyptian people work to build a new government, women have not been invited to the table. There are no women representatives in the Constitutional Committee that has been formed to prepare for free elections. The Egyptian Centre for Women’s Rights just released a statement protesting the exclusion of women experts. The way I see it, both of these issues have the same cure – and it’s also at the root of my work. We have to support women’s right to self-determination. Only then will they be allowed to participate in their government, walk safely down the street, and have relationships free of violence.